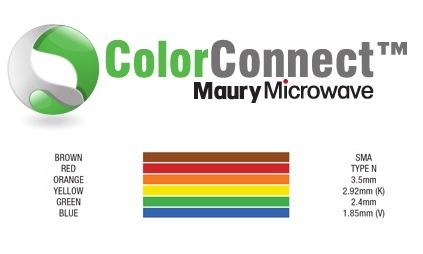 Maury Microwave has introduced a new series of color-coded 65 GHz attenuators. The ColorConnect solution developed by Maury helps reduce damaged equipment, degraded equipment reliability, degraded performance and lengthy maintenance times due to improper mating (and attempted mating) of incompatible interconnects. 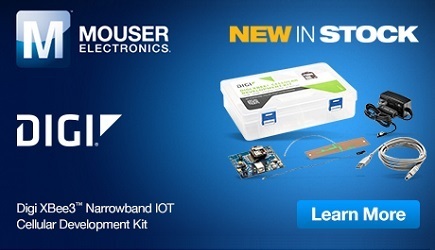 Following the proposed IEEE high-frequency connector/adapter color convention, AT-Series attenuators are the first commercially available attenuators to offer clear indications of compatibility and intermatability. The AT-series of fixed coaxial attenuators are used to reduce the power of a RF, MW or mmW signal without distorting its signal quality/waveform. Attenuators are often used to lower the amplitude of a signal to a measurable level or to protect a measurement instrument from damage. They are also used to improve matching between components by improving the return loss (twice insertion loss) and effectively reducing the VSWR seen by adjacent components. Key attenuator parameters include attenuation, frequency bandwidth, power handling, VSWR and quality/repeatability of connector. The AT-Series from Maury Microwave is a series of fixed coaxial attenuators that are available in multiple connector and attenuation configurations from DC to 65 GHz. These unique attenuators use a unique connector/adapter color convention to offer clear indications of compatibility and intermatability. ColorConnect™ makes it a simple matter to avoid and eliminate damaged equipment, degraded equipment reliability, degraded performance and lengthy maintenance times due to improper mating (and attempted mating) of incompatible interconnects. These attenuators can handle up to 2 watts of power and are available with SMA, 2.92 mm, 2.4 mm and 1.85 mm connector interfaces and attenuation levels of 3 dB, 6 dB, 10 dB and 20 dB.